If Blue Planet II has inspired you to help our oceans, then you've come to the right place! Below we share some links and information on the issues our oceans face and how small changes you can make really can make a difference. No one in the UK lives more than 70 miles from the coast. And remember, the oceans connect us all so what you do doesn't just help marine life in and around the UK coast but will help our oceans globally. Every year, around 8 million metric tons of plastic waste enters the ocean, where it can prove fatal to marine life. Simply spend just two minutes doing a litter pick down on the beach, or if you can’t get to a beach then a litter pick anywhere will help to improve your environment. You can even document your efforts online using #2MinuteBeachClean and share your efforts on Facebook, Twitter and Instagram. We’re inspired by Jan Wells, a very dedicated dog walker who committed to do a beach clean every day for a whole year! In 2016, 6,000 volunteers cleaned 364 beaches by attending one of the Marine Conservation Society organised cleans! Fishing boats in the UK catch up to 150 different species, but most people in the UK only eat five! What on earth is a nurdle? 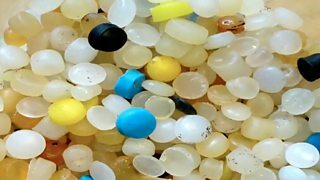 These tiny, lentil sized plastic pieces are by-products of various manufacturing processes and end up in our oceans in their millions as a result of mishandling and accidental spilling in industry. If you find any nurdles, The Great Nurdle Hunt want you to log them on their website to help to show the scale of the problem and to understand more about their distribution. Some of the world’s deepest living sea creatures have been found to have plastic in them. Researchers at the Scottish Association for Marine Science sampled creatures off the Western Isles and a staggering 48% were found with plastic in them, at depths of up to 2,000m (6,561.8ft). Read more. These plastics consisted of polyethylene and polyester found in plastic shopping bags and clothing. Polyester fibres can reach the seas in waste water from washing machines and to add to the problem, many household and cosmetic products contain tiny pieces of plastics, known as microplastics. These plastics are washed down the drain when you brush your teeth, scrub your face or clean the house and can end up in our oceans as they are too small to be caught in water filtration systems. The good news is that the UK government pledged to ban plastic microbeads by 2017 and there’s a free app, which can help you find out whether your face scrub or toothpaste contains plastics. The Beat the Bead app scans barcodes on household and cosmetic products, checking whether they contain these harmful plastics. Download the app for your iPhone or Android device. Used for just a few minutes, plastic straws can take hundreds of years to decompose if not recycled. Seabirds like these wandering albatross travel thousands of miles in search for food. Often mistaking plastic for food, this ends up in their stomachs and so in their young as well. Read more about how some pubs have stopped automatically putting straws in their drinks. If you eat seafood are you eating plastic? The world's seabirds are in decline. By inviting eagle-eyed members of the public (you!) to spot guillemots and kittiwakes on sea cliffs, scientists are better understanding the populations in remote areas of the UK coast and further afield. Start spotting and report your sightings on the Zooniverse website! There are over 650 species of seaweed on UK shores and scientists are keen to better understand distribution. In conjunction with the Natural History Museum you can download a free guide, which helps you to record a 5m plot of beach, logging the plants you saw. Spotted a basking shark, marine turtle or jellyfish? Our Blue Planet is a digital project to get you talking about our oceans - which ocean stories have got you talking? Have you spotted an undulate ray along the Jurrassic coast? If you have ever wondered where the fish you eat comes from then this handy guide and free app from the Marine Conservation Society, will help you to choose sustainably caught fish. This in turn protects fish stocks and other marine wildlife and habitats.